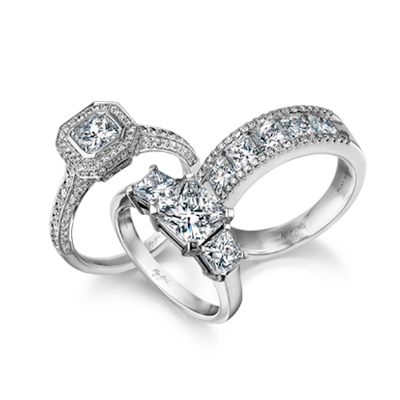 The iconic Millennium is known as South Africa’s most coveted diamond engagement ring and now it’s available in the US. The Shimansky Millennium ring features only the best hand-selected diamonds from South African mines, which in addition emphasises the combination of fire, brilliance and scintillation. The two metal bands on each side of the Shimansky diamond represents the coming together of two lives. The timeless and elegant design is truly the symbol of forever. Enjoy the beauty knowing that each ring has been designed with technical precision and innovation in mind; a remarkable feature that will live on from one generation to the next. The Millennium diamond ring shown has been expertly set with a 1ct round brilliant cut diamond and can be crafted in pure platinum, 18K white, yellow or rose gold. The iconic Millennium design is a Shimansky original and can be created based on your specifications with a hand-selected Shimansky diamond.